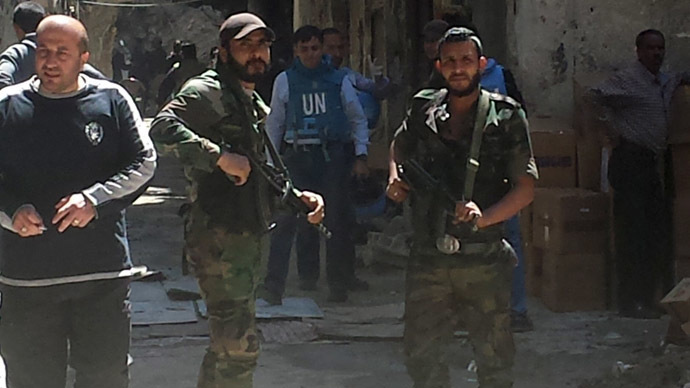 Palestinian "volunteer forces" stand guard while NGOs tend to Yarmouk camp residents receiving food aid, medical assistance and evacuation. Palestinians didn't jump into the fray in Syria. They were dragged into it - violently and reluctantly. Here is the story of how and why Palestinians and their 14 refugee camps became strategic targets in the Battle for Syria. Yet UNRWA spokespeople have hit social media channels with a vengeance, loudly suggesting that 18,000 civilians inside Yarmouk are somehow dependent on their food aid. This is simply false. UNRWA has not had the financial or material capability to expand and extend its operations to meet Palestinian needs during this conflict. They continue to assist with schooling, provide food supplies and medical kits, but everywhere you turn in Yarmouk, Jeramana or Homs, there is also now an adhoc Palestinian committee doing the fieldwork and cobbling together assistance.